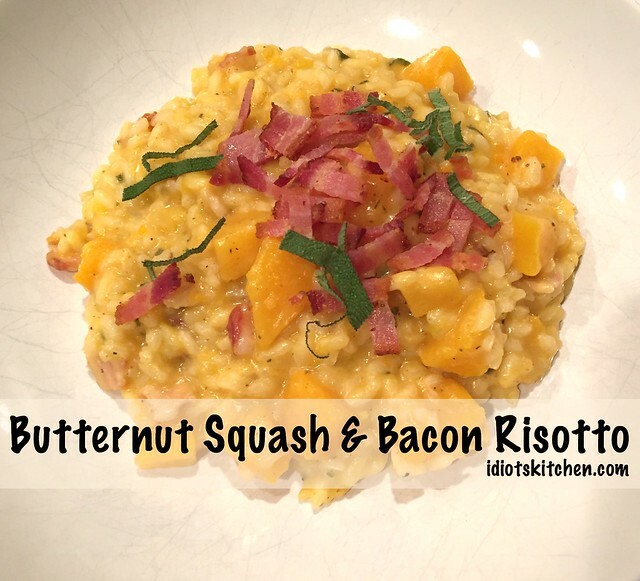 Butternut Squash & Bacon Risotto. Hello, my lovely! So many good things going on in one dish…butternut squash meets smoky bacon with a little zing of fresh sage. 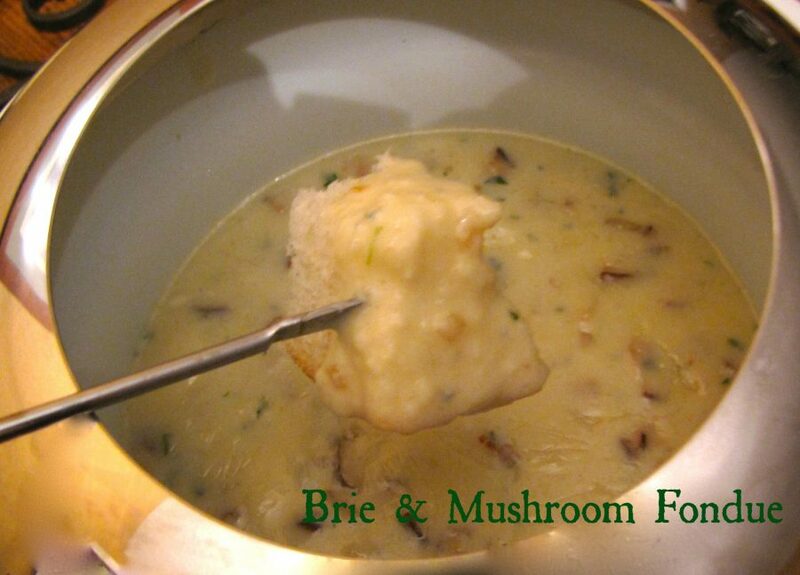 All of this in a creamy, dreamy pot of golden risotto. I’ve made a lot of recipes with butternut squash. The only thing that ever keeps me from wanting to try a new squash recipe is if it requires you to peel and cut up the raw squash. I will be honest with you…it’s a complete pain. I usually convert recipes to pre-bake the squash thus eliminating this annoying peeling & chopping. However, for this recipe, you want distinct cubes of squash and you also want to make a sort of squash infused broth so there is really no way around the peeling and chopping. 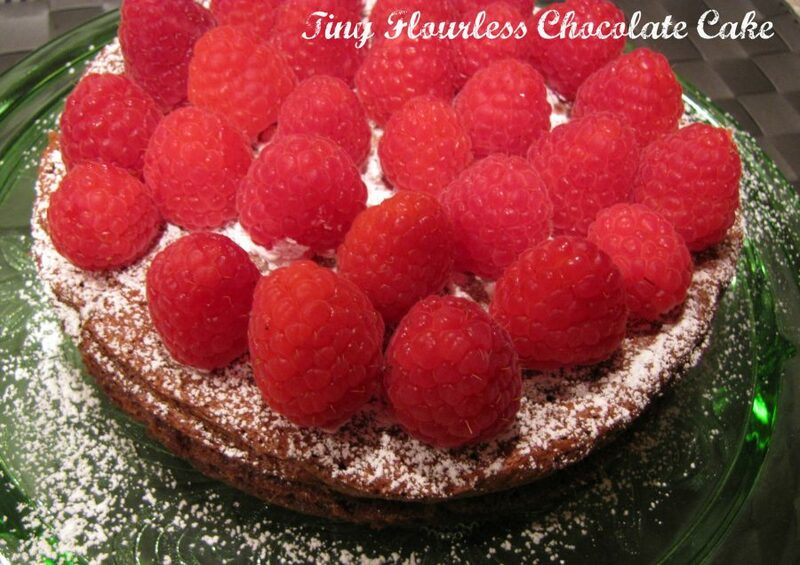 That said, this recipe is TOTALLY worth the extra effort. Just PLEASE be careful of your fingers as you are cutting through the hard squash. Use a vegetable peeler to remove the thin, tan outer peel of a 2½ – 3 pound squash. 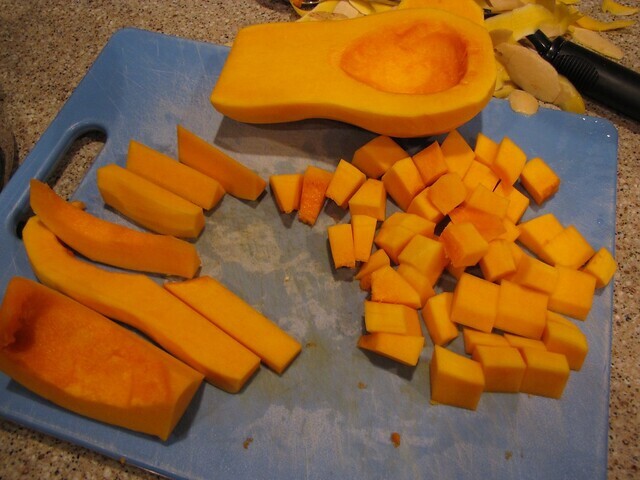 With a large sharp knife, cut the squash in half vertically then use big spoon to scoop out the seeds. I find that the easiest method is to cut the squash halves in half again horizontally so you’re cutting the round bottom end where the seeds were away from the top half. Then cut both sections into strips and then into small cubes, about 1 inch. The good news is chopping the remaining ingredients will seem like a breeze! 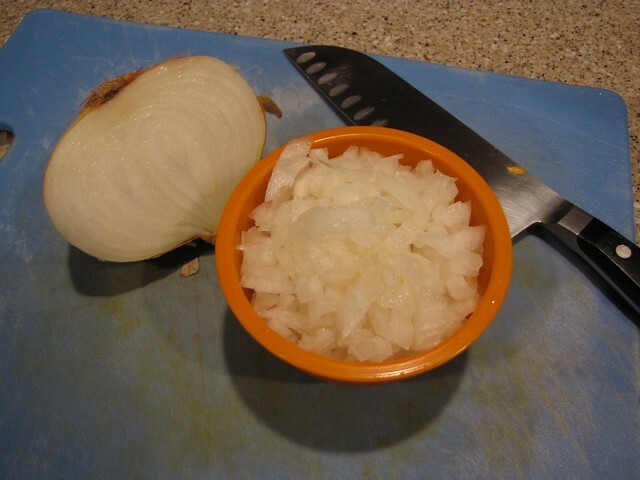 Finely chop 1 medium onion so you have 1 cup. 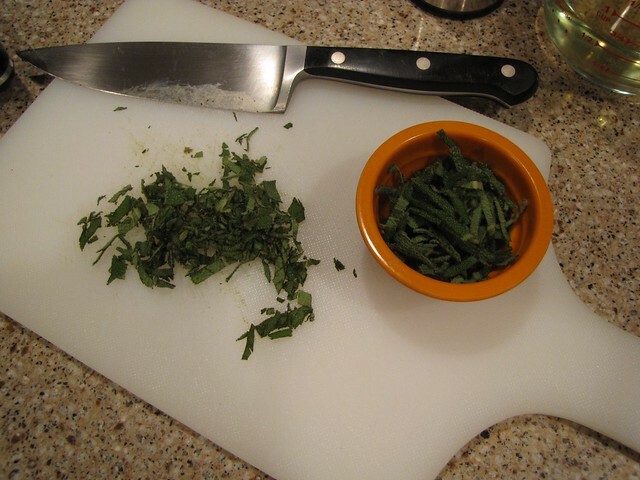 Strip the leaves off several stems of fresh sage to equal about 2 Tablespoons. Cut the leaves into strips and set 1 Tablespoon of strips aside for the garnish. Finely chop the remaining sage to go into the risotto as it cooks. Bacon! This is the time to get really good, thick cut bacon. 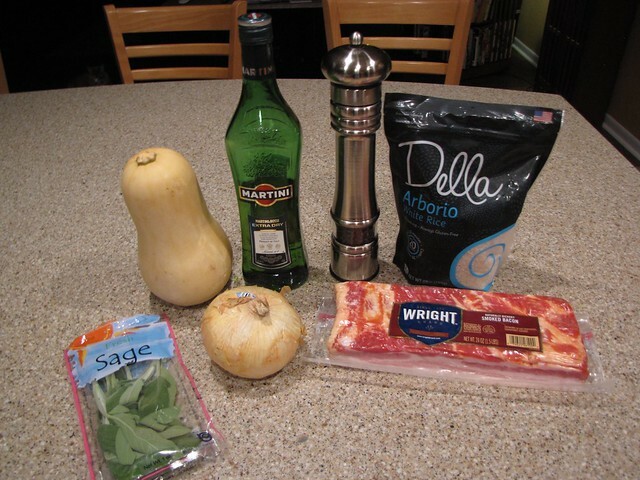 The bacon gives this risotto great smoky flavor so you will notice a difference if you buy a higher quality bacon. You need 6 strips total. 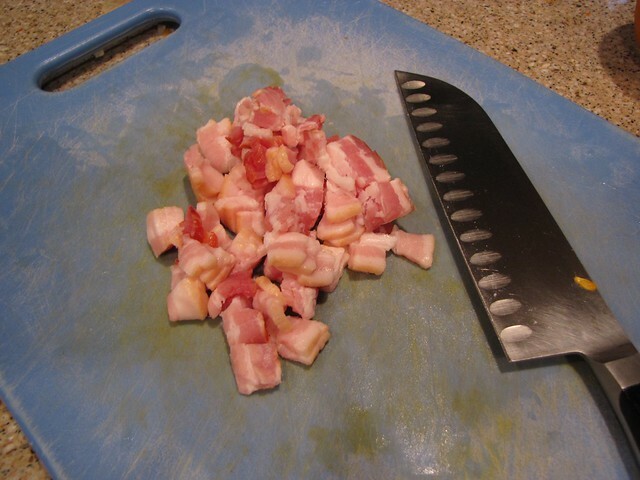 Keep 3 strips whole (or cut in half to fit your pan) and chop 3 strips into small pieces. I had to share this. 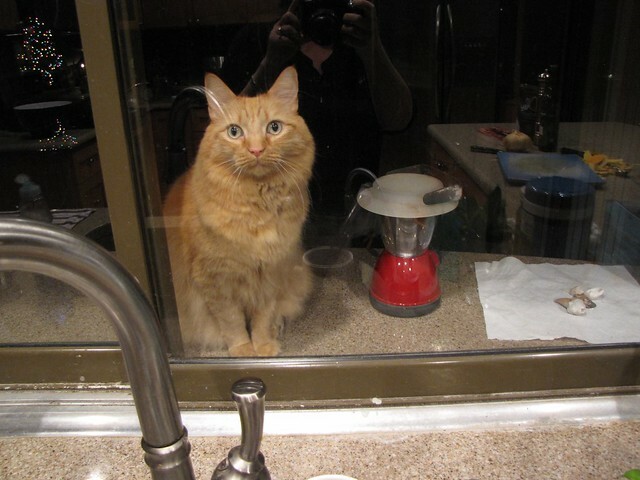 You can see in the reflection that I had just finished chopping the squash. This is what happens when Henry goes out on the lanai (big screened in patio, for you northerners) and someone (Jim) shuts the door. He doesn’t really need to come in. He just wants me to leave the door ajar so he can come in. If I don’t react quickly enough, he will bang on the window. Okay, let’s put all this together so we can eat risotto! 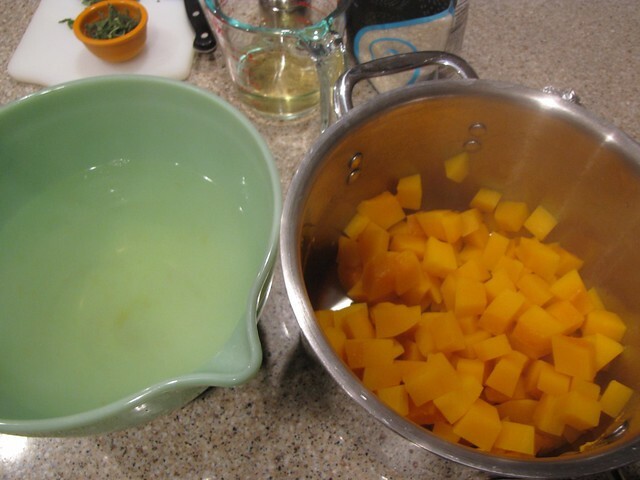 Place the cubes of squash in a large sauce pan with 4 cups of water. 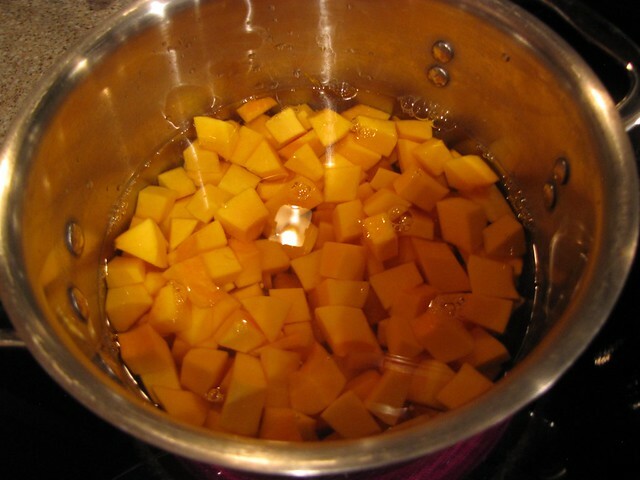 Add a little salt (1 teaspoon) to season the squash as it cooks. Bring to a boil and simmer until the squash is tender but not falling apart, about 10 minutes. Drain the cooking liquid into a large bowl or another pot. DO NOT DISCARD THIS COOKING LIQUID! 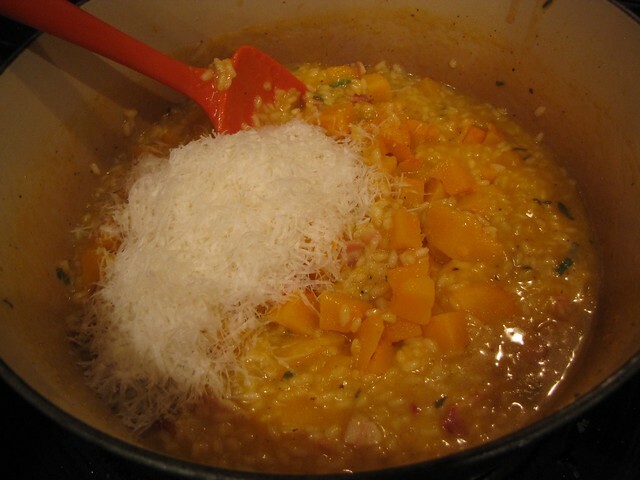 Set aside HALF of the cooked squash cubes to add to the finished risotto. 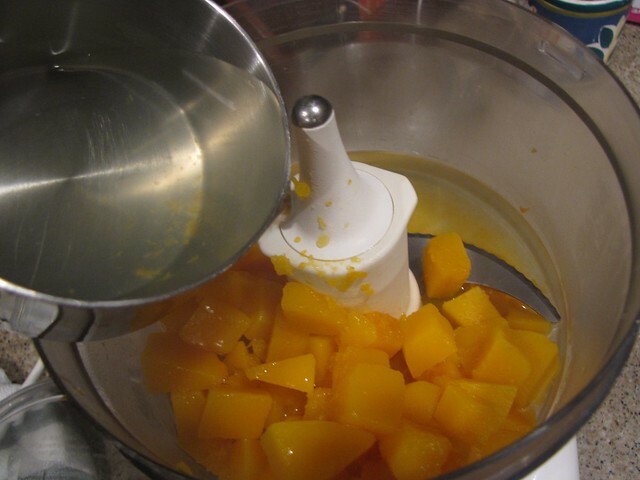 Add the other half of the squash to a food processor or blender. Add 2 cups of the reserved cooking liquid and process until smooth. It’s like a warm squash smoothie. 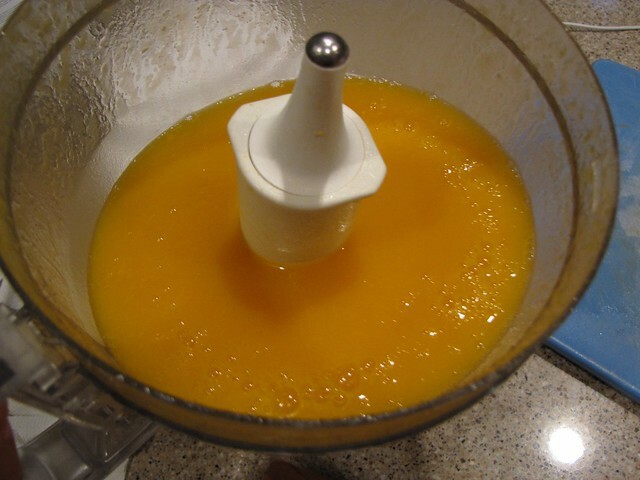 Transfer the smooth squash mixture to the pot with the rest of the reserved cooking liquid. Place it back on the stove over low heat until it just barely simmers. This is the cooking liquid for your risotto. One trick that I’ve learned that makes cooking risotto much easier is to choose a pretty large pot. I’m using my big dutch oven but any big pot will do. 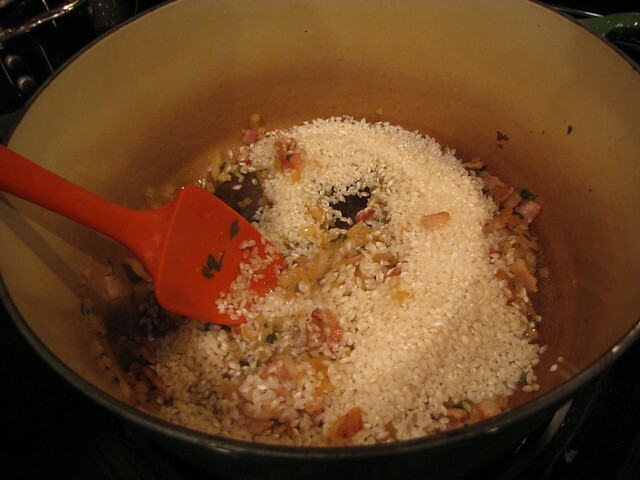 If your pot is too small, it makes stirring difficult and the risotto takes much longer to cook. Place your 3 whole (or in my case half) pieces of bacon in the large pot over medium heat. 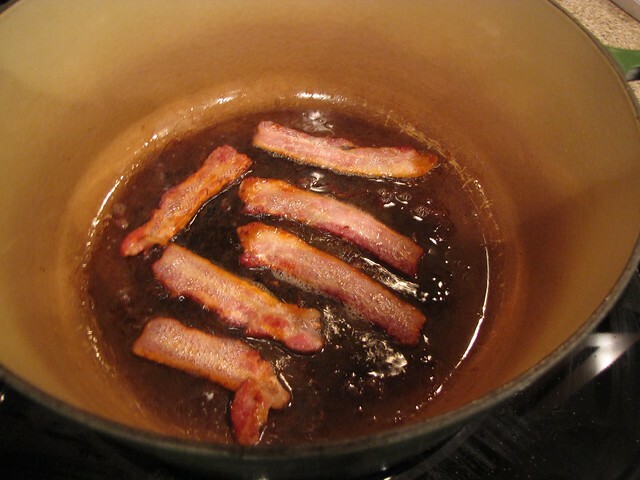 Cook until golden brown then remove the bacon and drain on a paper towel lined plate. Hide this cooked bacon from your self, spouse, or family. You need this for the garnish. Discard the bacon grease from this first batch of bacon. Wipe out the pot with a paper towel if there are any browned or burned bits. 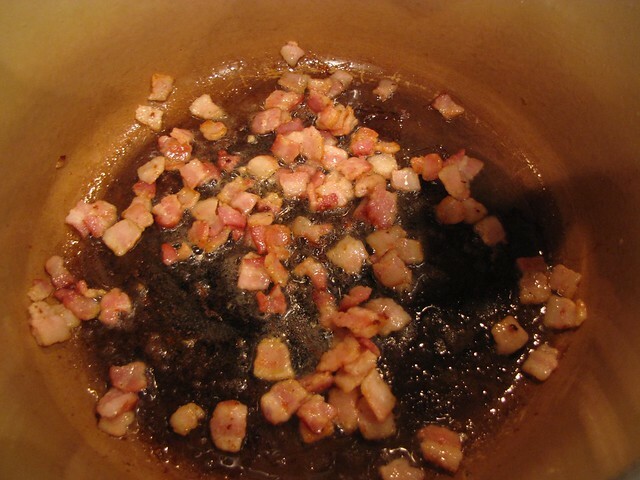 Add the chopped pieces of bacon to the same pan over medium heat and cook until they just start to color and are about ¾ done. 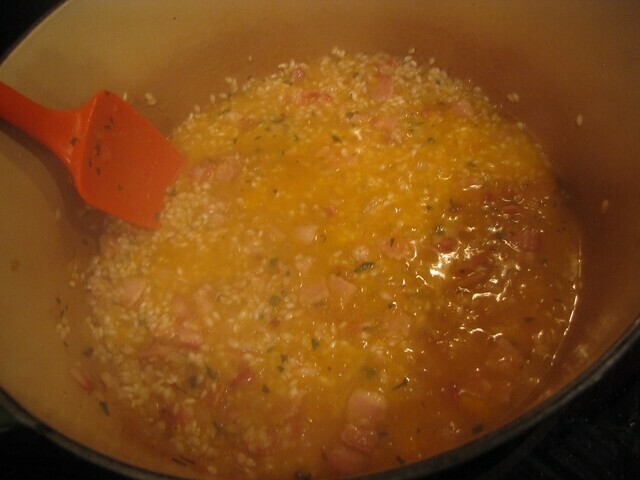 This will give you plenty of bacon grease to cook the rest of the risotto. I know it seems sacrilege to throw out the other bacon grease but if you kept it all, this would be way too oily and (if possible) too bacony. By the way, unless you love your plumber and want to see him more often, never pour bacon grease down the drain. I keep a small can in the freezer (like a can from beans or chicken broth), pour in the grease, let it freeze, then toss it away on trash day. 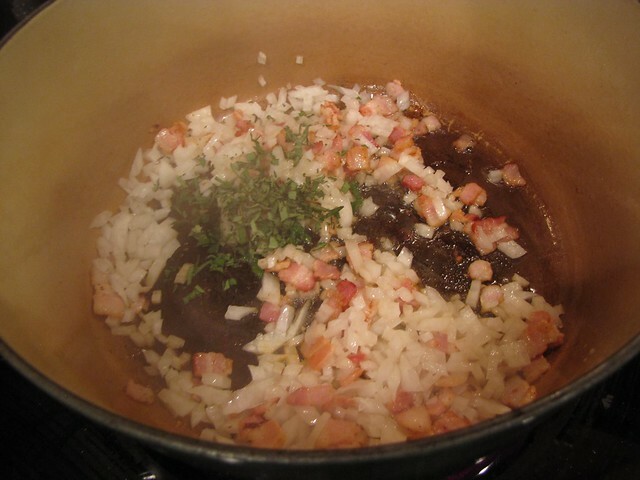 Add the chopped onion and chopped sage to the bacon and sauté until the onion is golden but not browned, about 5 minutes. Add 1/2 teaspoon of rubbed/dried sage. 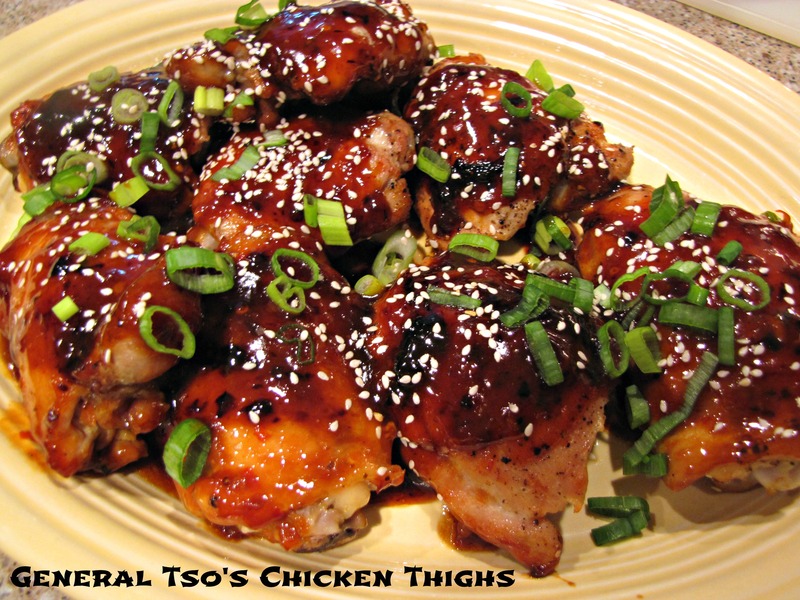 The combination of the fresh and dried really highlights the sage flavor of this dish. If you’re unsure of the sage flavor, you can use only fresh or dried, taste it and add more later. I like sage so I ended up adding both. 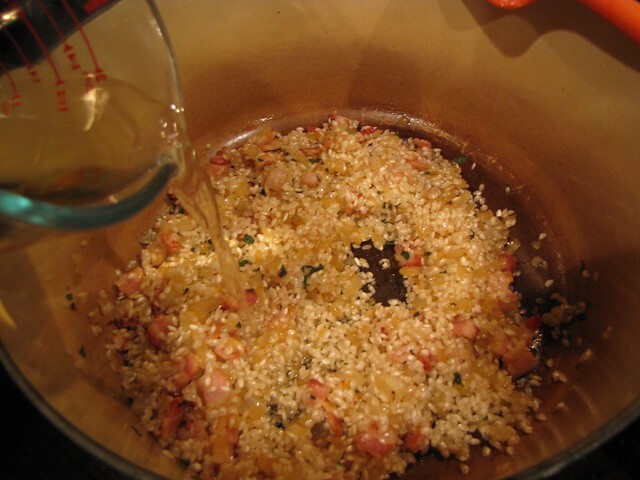 Stir in 1½ cups of arborio rice being sure to get the rice fully coated in the onion and bacon mixture. Pour in ½ cup of white wine and stir it quickly into the rice. Shocking, I know, but I was out of white wine when I made this. A goood tip is that in many cases, you can substitute dry white vermouth for wine with very little flavor difference. Even over medium heat, the wine will absorb almost immediately. 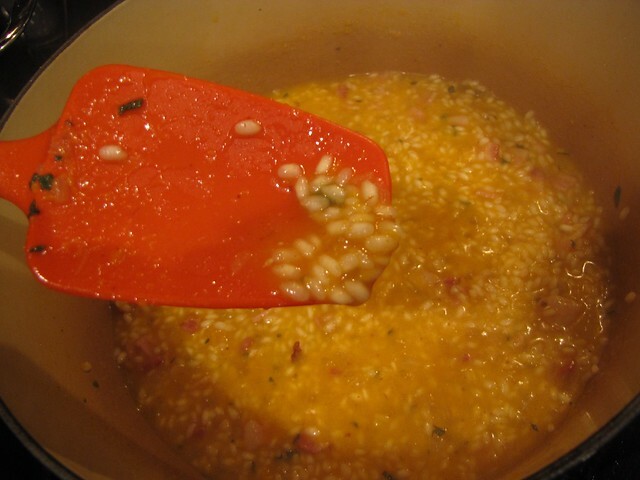 The key to creamy risotto is constant stirring so that the starches in the rice develop. Unlike regular rice, you add the liquid a little at a time. I use a soup ladle but you could also use a 3/4 measuring cup as a dipper. 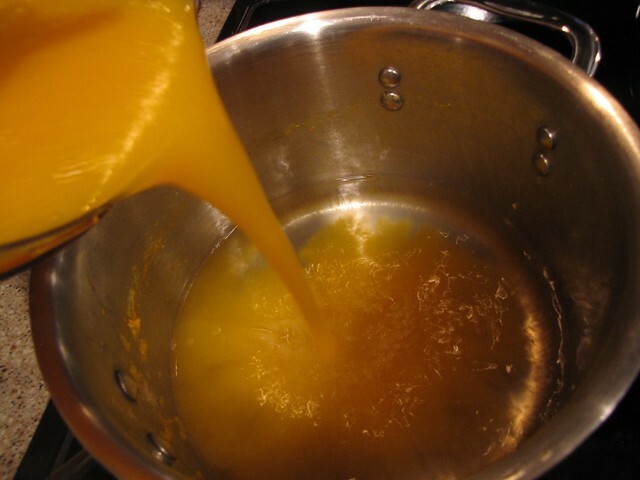 Add 1 ladle of the butternut squash liquid and stir, stir, stir over medium heat until it has all been absorbed. 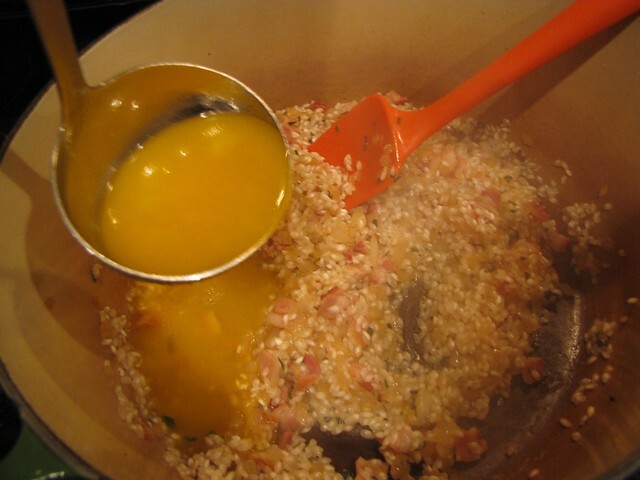 Keep doing this – adding liquid and stirring until it has been absorbed until you have used almost all of the liquid and the risotto is tender to the bite. You can’t rush this. It takes about 20 minutes of ladling and stirring so enlist a friend or grab your beverage of choice. Consider this your 20 minute risotto meditation. You’ll see that as the risotto cooks, the little grains of arborio rice begin to plump up. When you’re getting toward the end of your cooking liquid, taste a few grains of the rice. If it is still crunchy in the middle, keep going. If you run out of the squash liquid, and I usually do, add a little bit of water. I added an extra ¾-1 cup of water to get the risotto to an al dente stage. Just like pasta, the risotto should be tender with just the tiniest little bit of “bite” in the middle. When you add your last bit of cooking liquid, gently fold in the reserved cubes of butternut squash. I also added ¾ cup of shredded Pecorino Romano cheese because risotto without cheese just seems wrong. 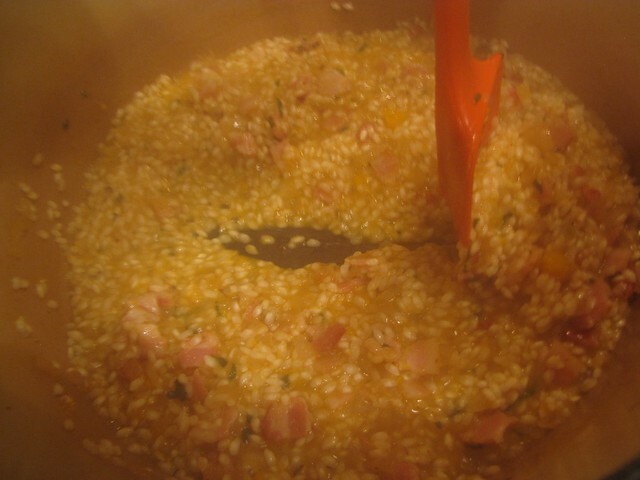 Taste the risotto and season with pepper, salt (the bacon is salty enough for me), and more sage as needed. Spoon into a bowl and top with crumbled bacon and the reserved strips of fresh sage. 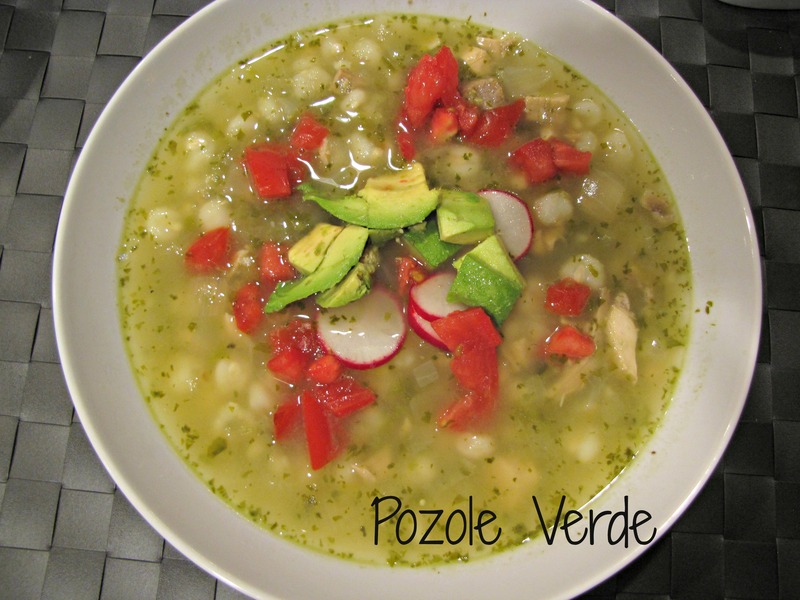 I love the combination of the blended squash in the cooking liquid and the soft cubes of squash added at the end. Add a small green salad and a glass of white wine and invite me over, please! 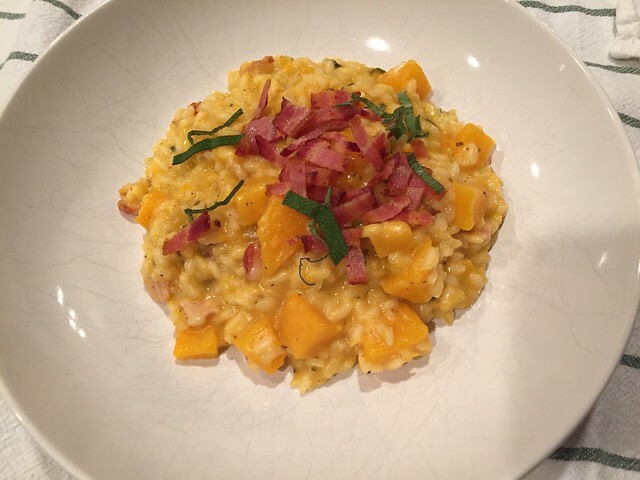 Butternut Squash & Bacon Risotto got two big thumbs up (and a paw from Henry once he came inside) at our house.